Have you ever thought about moving your home or building to a new lot? If this is a serious consideration for you then you already know how many different things you need to consider. Cost, of course, is something that you really need to think about before you make your decision. There are different factors that are going to affect the cost of moving a building. Even with the most experienced building movers, what affects the cost usually stays the same. First, you want to think about location and size. The location of your building is important because it may dictate how easy it is to pick it up and move it at all. If your home is nestled between trees and at a distance from the road, you’re going to have to put that into you calculations. Most buildings are easier to transport if they are on a street to begin with. This leaves less nature to contend with. Additionally, you’ll want to make sure that your building movers know if you’re in a flooding zone. When you’re considering costs, you also have to consider any potential accidents that may occur. When you live in a flooding zone, experienced movers will be able to make sure that your home or business stays dry during the move. However, you may have to figure this extra amount of work into your overall cost. It is better to make sure that you have someone experienced, so that you don’t run the risk of damage. Smaller structures are easier to move and take less time. Larger or older structures, on the other hand are going to take more work to preserve the building and to make sure that it reaches its destination intact. 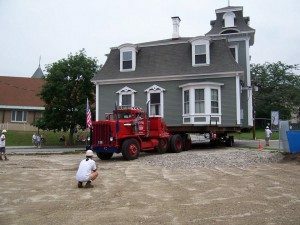 When it comes to moving a residence or business, there are a lot of options out there. For many people, moving the building they own sounds like a good idea. The truth is that it can be a smart move for many. As long as you keep the costs in mind, hiring building movers to take your home somewhere else is a financially smart move.